Last summer, this yogini stumbled into a goal-oriented workshop seemingly geared toward Silicon Valley execs, Navy SEALs, and the Red Bull innovation team. Ironic for a yogini, right? Let me explain: I had a week off work and decided to finally go to Esalen, a retreat center in Big Sur that I'd been meaning to check out. A workshop titled "Stealing Fire" fit into my schedule, so I signed up before I read about it, assuming it was some sort of "fiery yoga" type thing. Since I spin fire and love yoga, I thought this workshop would be perfect! 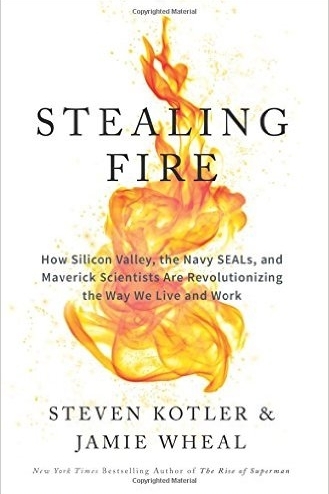 Once I looked into the workshop, I learned that it would be based on a soon-to-be-released book, "Stealing Fire: How Silicon Valley, the Navy SEALs, and Maverick Scientists Are Revolutionizing the Way We Live and Work," by Steven Kotler and Jamie Wheal. Steven Kotler, by the way, is the guy who wrote "The Rise Of Superman," and hangs out with guys like Sergey Brin, Richard Branson and top Harvard scientists. I must admit, I was nervous to spend four days with such driven people. I arrived wearing a fake pink fur coat and carrying a hula hoop, feeling like the hippie in the conference room. In a nutshell, the book explores how Silicon Valley executives, maverick scientists and special operations, like the Navy SEALs, have harnessed rare and controversial states of consciousness to solve critical challenges and outperform the competition. Over the next four days, I learned a lot. We discussed the "flow state," also referred to as "ecstasis," or an elevated state of flow and transcendence, which are states I relate to and experience in yoga. To understand the flow state, we also had to understand the nobs and levers of the brain, the hard-wiring of the brain as well as study how the brain and consciousness work together. After the retreat last summer, I was eager for "Stealing Fire" to be released the following February (2017). Fast forward to a few weeks ago, when I saw the authors at a book launch in San Francisco and had the opportunity to reconnect with Steven and learn more about the concepts of "Stealing Fire." In the book, the authors talk about cognitive literacy, which they define as "understanding how our neurobiology affects our psychology." Steven and I discussed how this applies to the yoga practice. I asked him what parallels, if any, can be drawn between yoga and the achievement of the flow state. "Yoga is a great way into flow!" he said. "Even just 20 minutes a day will relax the pre-frontal cortex. Ashtanga and Bikram yoga, which offer the same poses in the same sequence every day, will produce a trans state (alpha theta), but don't release dopamine or endorphins. Doing the same practice everyday does not induce flow but there are different styles and gateways. Kundalini yoga, for example works well with endorphins," he said, noting that yoga practice, in general, is simply formulated to exhaust the mind, making it easy to meditate. In the book, the authors also talk about the blindspot, which they refer to as "The Pale," which has three components: The Pale of the State, The Pale of the Church and The Pale of the Body. This explains why the experience of ecstasis has been elusive; in other words: the social constructs that bind us prevent us from entering the flow state. "There are masculine and feminine qualities in everyone," Steven said. "The 'flow state' does a lot to access these 'feminine' qualities: healing anxiety, cooperation and collaboration, creative problem solving as well as others. The point is, if you want the best from your employees, you need these skills. Period." We also talked about one of the categories of flow-selflessness. Patanjali said selfish thoughts will bring misery while selfless ones bring us peace. I asked Steven for his thoughts on selflessness. "Selflessness is a core experience of ecstatis; the self goes away in the flow state. When the idea of the self goes away, anxiety gets dialed down and we are able to be more generous with our time. Altruism itself induces a state of flow," he said. After both the weekend retreat last summer and the more recent book tour event, I understand the neuroscience behind the flow state a bit more and realize that we really are all seeking to align with that state. After all of my initial resistance and fear, I realize ecstasis is something I experience on the mat (and when I do fire performance) and I'm lucky to have found it! To learn more about how to find your flow state visit stealingfirebook.com to get your copy of the book or check out the Flow Genome Project Facebook page. May 15 A Lesson From Yoga: LOVE The Body, Just As It Is.